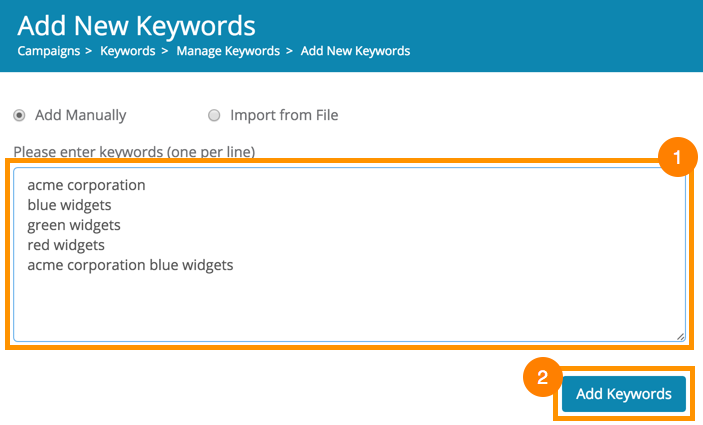 To add new keywords to Dragon Metrics, you can visit Keyword Management page or Keyword Group page. 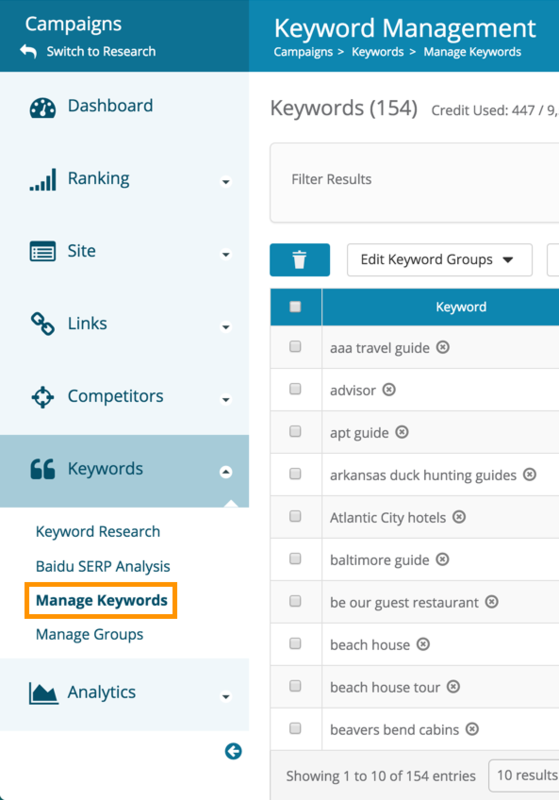 This article will show you how to add keywords in Keyword Management page, adding keywords in Keyword Groups page is covered here. The difference between adding Keywords in Keyword Management and Keyword Group page is you can have indefinite amount of keywords stored in the Keyword Management page without assigning them to a Keyword Group, but the number of Keywords you can have in a Keyword Group will depends on the amount of Keyword Credits available in your campaign. After entering Keyword Management page, click the button with the + icon on the upper right side of the table. 3. After you have finished modifying the template, save and upload the file to the same window where you've downloaded the template and click Upload. 4. 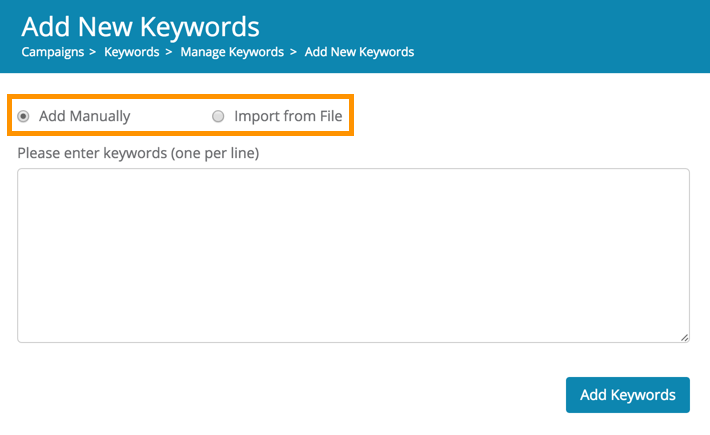 Verify Keywords were imported successfully or correct any errors, hit Save to add them to your list of keywords, see our Keyword Management Overview for more details on how to use this table. 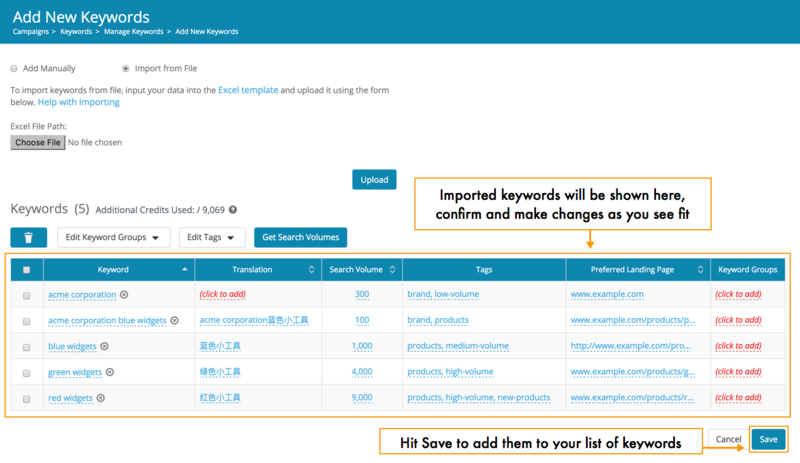 You may also add keywords manually one-by-one. 1. Begin by adding keywords into the text box, one per line. Click Continue when you're finished. 2. You'll then be presented with a table where you can add and confirm any (optional) keyword details, see our Keyword Management overview for more details on how to use this table. 3. When you're satisfied with the list you've entered, click Save to add these keywords your campaign.